范愈燕, 孙永新, 刘青山, 周亦伦, 李平, 梁秉中. 醛固酮诱导p21依赖性肾脏衰老的机制[J]. 中国医科大学学报, 2018, 47(8): 692-695, 700. FAN Yuyan, SUN Yongxin, LIU Qingshan, ZHOU Yilun, LI Ping, LIANG Bingzhong. Aldosterone Stimulates p21-dependent Cellular Senescence in the Kidney[J]. Journal of China Medical University, 2018, 47(8): 692-695, 700. Abstract: Objective To investigate whether aldosterone-induced p21-dependent renal senescence affects the development of renal injury. Methods In vitro, immortalized human proximal tubular cells were stimulated by aldosterone; in vivo, aldosterone induced renal senescence genes in normal FVB mice and p21(-/-)mice. Results Aldosterone induced elevated expression of the β-Gal, p21, TNF-α, and two collagen genes in immortalized human proximal tubule cells. These genes were significantly inhibited by knock-out of p21. 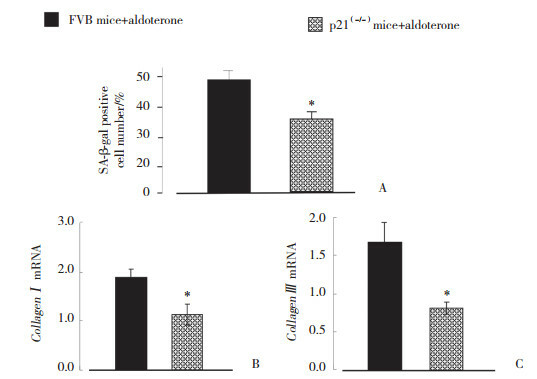 At the same time, normal FVB mice and p21(-/-)mice were stimulated through subcutaneous administration of aldosterone using a mini-pump. Increased expression of β-Gal, TNF-α, and the two collagen genes was seen in the kidney cortex of normal FVB mice, but not in the kidney cortex of p21(-/-)mice. 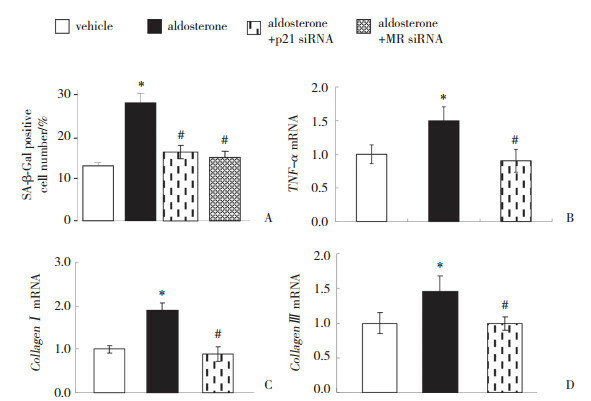 Conclusion Aldosterone-induced changes in TNF-α and collagen expression may be involved in p21-dependent cell senescence.